I have been using FT8 (mostly 10m RX) and it is good. Some of this is concentrating activity in a narrow slot of spectrum. OK, it is not as good as WSPR for really weak signals, but considering there are no sunspots I have copied loads of continents on 10m. In the past, people would have given up on 10m as “dead”. FT8 is proving there is plenty of life on the band. With hearing going bad I went from voice to PSK31 added PSK63 and later Olivia. When JT-65 came out I didn’t try it for a year. I did have fun with WSPR. Soon I tried JT-65 and JT-9. Kind of reminded me of watching paint dry, but I was more then surprised by the outstanding results. I like JT-9 better then JT-65 as far as pulling really weak signals out, but I never found that much activity,as compared to JT-65. Fast forward FT-8 came out and it blew me away with the speed and the number of contacts I could make with 50 watts or less and my 7 band 3kw Buckmaster OCFD antenna at 30 ft. Part time,as in maybe a hour a day, I was able to blow past 1000 new log entries. Then after the second month going into the 3rd past 2000 log entries without any effort. That is the draw of FT8. The other draw IMHO is that DX that I have not heard or was extremely hard to impossible for me to work, even QRO at 500 watts were now being logged for the first time. The reality is that all these DX station would have been not more then a basic exchange anyway, so what FT8 is doing is nothing more or less then a CQ TEST or a 1 minute exchange and 73 anyway. I have been a ham for 53 yrs. Novice in 1963. I never mastered CW do too learning it all wrong. So stuck with a Tech license and with work and travel even HF and vhf was something I had very little time to do. Now retired and having more time I am relearning CW and at a blazing speed of about 15 WPM..kind of sort of… Even with bad hearing CW works, but like SSB very weak signals will not be in my logbook. My feeling is FT8 is here to stay and will grow. JT-65 will also grow, but at a slower rate. I have little hope of JT-9 doing much. I have racked up a DXCC and WAS from LoTW and eQSL has netted me 6 awards with 4 close behind. Never had any wallpaper and this is kind of fun… That alone will keep WSJT-X growing. That all said CW will not go away and will keep increasing in numbers as well as SSB and RTTY because I really believe that in the end people still want more then Zombie radio and once you get all the wall paper using one mode, the then itch will be getting hams back into digital with PSK and CW and SSB. Steve, it’s really interesting to read a discussion on this subject that hasn’t descended into polemics, and that’s probably because you set the tone right in the first place. Thanks for that. I’ve been in the hobby since 1957, and licensed since 1979, so maybe I’m a bit of a dinosaur, but I still prefer SSB and CW, with the latter being my mode of choice. I can see the attractions of the various digi modes, but am not yet ready to do more than have a look at them every now and then to satisfy my curiosity. Each to his own. Harry, I think you did the right thing by calling CQ on an apparently empty band, and it would probably be a good idea for all of us to do that more frequently. This also implies that we should all make an effort to answer CQ calls we hear, regardless of where they are from. Only then will the band activity pick up and set the ball rolling to attract more people back into the traditional modes because they can hear more going on. I guess it comes down to being the change you want to see. Good article. 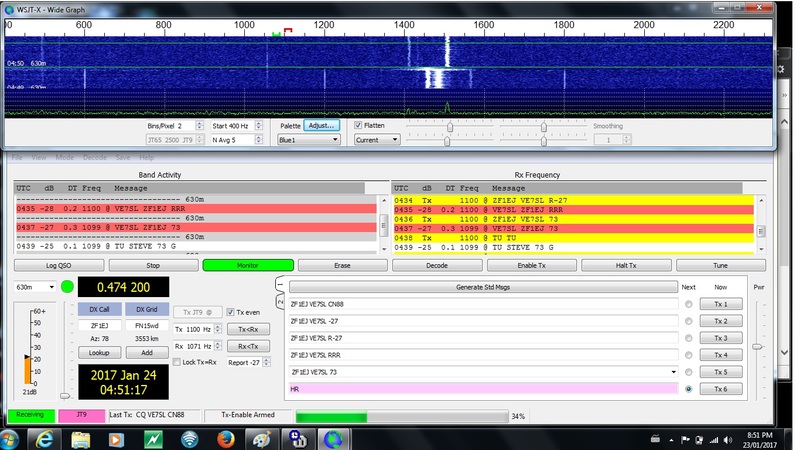 I am a die-hard JT65A guy, with JT9 a close second in my preference, when I am seeking to get some DX into my logbook. Despite the lemmings-to-the-sea inrush of new digital operators infatuated with FT8, there are those who enjoy and covet the conversational digital modes. Seeking more than just wallpaper, these operators take joy in meeting new people and learning about their culture, their view of the hobby, and more. Some even develop long-lasting friendships because of the conversations they have via keyboard-to-keyboard digital modes. One such mode that is still very popular, even in emergency communications around the world, is OLIVIA. See my new post here on AmateurRadio.com at http://www.amateurradio.com/come-join-the-fun-with-olivia-on-hf-shortwave-digital-mode-olivia/ for some information I put together about this mode.